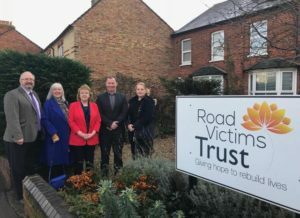 The Bedfordshire Magistrates Association were delighted to meet with the Road Victims Trust to present a cheque for £1060 as a result of a year of fundraising activities. The Road Victims Trust is a Kempston based charity that provides free emotional and practical support to all persons affected by a road death in Bedfordshire, Cambridgeshire and Hertfordshire. Each year the Trust supports in excess of 500 people by way of a face to face counselling service. The Magistrates Association raised the money with a series of fundraising days, raffles and presentations.